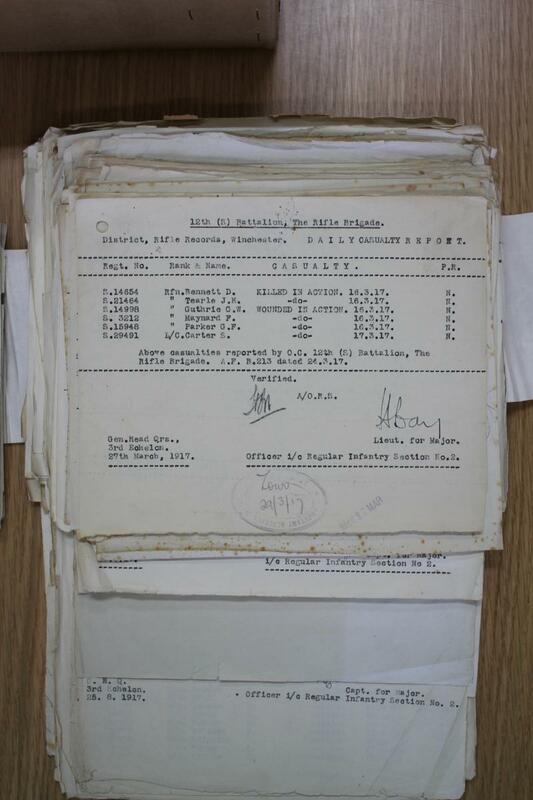 Surviving 'Casualty Books' from infantry battalions? Having spent the last month working my way through the three Casualty Books of the 1/6th Liverpool Rifles-stretching to nearly 800 pages and covering every officer and man who served overseas with the battalion- curiosity begs the question, is this a unique resource, or have Casualty Books from other battalions survived in archives somewhere? Interests:311th Brigade RFA. The salient from Boezinge to Ploegsteert and the Arras area. Moseley Rugby Club. British real ale and Belgian Beer. I can't answer your question but that looks fascinating! It's a stunning resource- almost as good as having the Service Record for every man in the battalion, though I reckon there's at least another two months work to transfer the relevant bits into my database. I'd kill for a resource that like ! The 3rd (Reserve) Bn Royal Sussex Regt kept a similar ledger but not quite with the same level of detail on every man sent out as a reinforcement. Lots of detail on casualty type, dates and hospital, returned to UK etc. Your ledger appears to have much more detail. 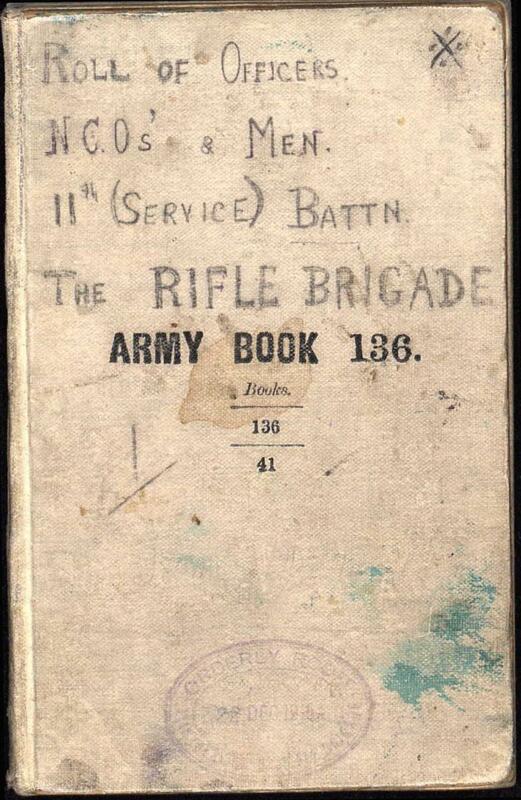 I am curious to know if it is a battalion ledger rather than a 'Casualty' ledger i.e. does it include men who were not casualties? Edit. I think some battalions of the Border Regt have similar resources. "Glory is No Compensation" (Border Regt at Gallipoli) has fine detail on everyone who served, suggesting some ledger or record exists. I am curious to know if it is a battalion ledger rather than a 'Casualty' ledger i.e. does it include men who were not casualties? They're the ledgers used to compile the information for the B. 103 'Casualty Form- Active Service', so include every officer and man who served in the battalion-casualty or not. Also of use as they include men who appear in the Medal Rolls for the 1/6th, but who were posted or transferred on to another battalion from an IBD without actually reaching the 1/6th, so I've been able to remove these from my existing database. Going to make for some accurate statistics for causes of sickness, casualty etc once I've finished. Once I've got all the pieces of the jigsaw together and start writing, it should help to put names to specific incidents from the Intelligence Summaries, Diaries etc. Not in quite as much detail, but still useful. 4th Rifle Brigade. Some recent research based on 1914-15 Star medal rolls has rather diminished my faith in the integrity of some of these documents. The disparaties between dates of disembarkation, casualty dates etc and the contemporary records such as war diaries are quite unsettling. They are not as reliable as I have previously believed. Having access to something like the ledger will add a whole new level of accuracy I think. There's still going to be some caveats, as I've already come across conflicting information (and I'm less than a quarter of the way through) with regard to numbers and name- and cross-checking with other sources hasn't always show the battalion record to be correct. 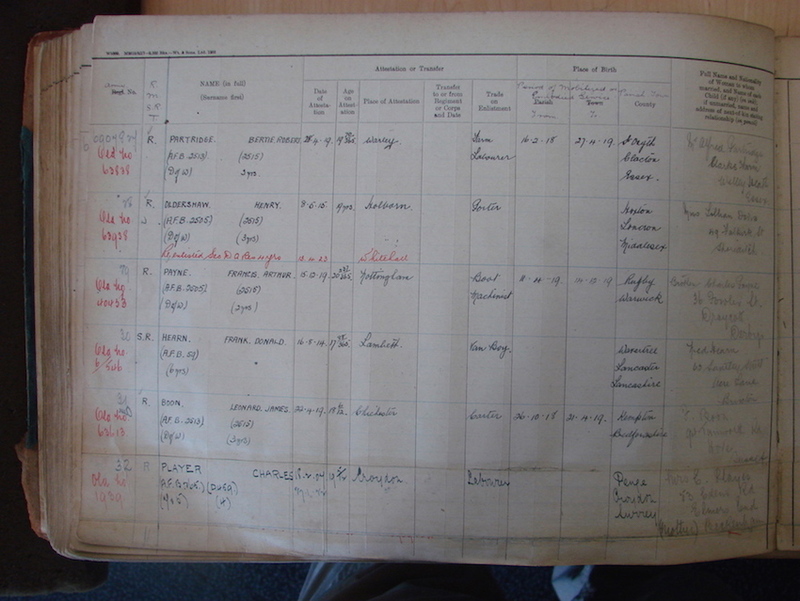 There are also clear conflicts with the dates for some casualties with for example, the 8th given as the date of casualty, but the Field Ambulance recording admission for the 7th. Much will depend on which 'calendar day' a particular unit was using at the time, as I've discovered 55 Division had no policy of 'all the same'. For example, at one point Division was running their day from 9 a.m. to 9 a.m. the next, brigade running from 10 a.m. to 10 a.m. for their Diary, but noon to noon for casualties, and an individual battalion was using the calendar day! Although this is a pain, it does sometimes help pin a casualty down to a particular event and location, as reported in timed entries in Intelligence Summaries. 1/1st Bucks Bn casualty books are in the county record office in Aylesbury. 1st Battalion RWF casualty books are with the regimental archives in Wrexham Museum. One alphabetical volume currently misplaced. PS - nearly forgot, one of the Liverpool Pals ones is held by the Dept. of Printed Books, IWM Lambeth...sorry but I can't remember which, though it included a Shot At Dawn case if that's any help. Great to hear that others have survived. My great uncle Lance Corporal 240369 AlfredvGeorge RIGBY served with the 1/6th Kings Liverpool Regiment and served from August 1914 until he was KIA on Sept 20th 1917 during the battle of Passchendarle. I have been researching him for my mother but his service record did not survive and there is therefore no info about what actually happened to him. Would your records be able to shed any light on this? Originally enlisted as No 1805 on 8/8/14 [renumbered to 240369 early in 1917]. His parents had been married for 25 years - 9 of their 12 children had survived. Battalion in huts. All officers and NCOs to Mersey Camp to see model of Routlebeke Area. Battalion in huts.Camp shelled a little. 1 casualty died of wounds. 'X' Day. Battalion in huts. Battalion moves up by light railway from Vlamertinghe to St Jean after dark. Major SE Gordon in command. Battalion assembled in Old British Front and Congreve Walk, HQ in Oxford Trench dugouts. 'Y' Day. At night Battalion forms up in battle position in the rear of 9 KLR between Bank Farm and Pommern Castle. HQ at Bank Farm. Major Gordon in command. Major Blackledge 2nd in command, Captain Phillips Adjutant. 'A' Company 2nd Lieutenant MacLaren, 'B' Company Captain Eastwood, 'C' Company 2nd Lieutenant NR Phillips, 'D' Company Captain Rome. Much difficulty in forming up owing to the rain and blackness of the night. 'Z' Day. 165 Brigade attack the Green Line from 100 yards south of Kansas Cross to a point 100 yards east of Waterend House with 9 KLR and 7 KLR to take first objective and 6 KLR and 5 KLR to take the Green Line. Zero hour at 5.40am. The 9th and 6th KLR became heavily involved in the fight for Hill 35, which was finally captured after a stiff fight, the 6th KLR consolidating strong points on Hill 35 including Lens. Major Gordon and Captain Phillips were wounded while reorganising the line for a further advance. Captain Eastwood, 2nd Lieutenant NA Phillips, 2nd Lieutenant Spratt were killed on Hill 35. 2nd Lieutenant Wallington and all of No 1 Platoon of 'A' Company were killed in a gallant attempt to capture a strongpoint to the south of Hill 35. The 1/5 Loyal North Lancashire Regt and 1/5 South Lancashire Regt having come up to reinforce, Hill 37 was captured by them and survivors of the Battalion. Towards dusk a strong enemy counterattack on Hill 37 was beaten off with heavy casualties to the enemy. At 7.30pm Lieutenant-Col McKay and Captain Brownell arrived from transport field and former took over command of the Battalion. Battle continues. Several strong enemy counter attacks beaten off. "At the beginning of September," said Sir Douglas Haig, "the weather gradually improved, and artillery and other preparations for my next attack proceeded steadily. Both the extent of the preparations required, however, and the need to give the ground time to recover from the heavy rain of August, rendered a considerable interval unavoidable before the new advance could be undertaken. The 20th of September was therefore chosen for the date of our attack, and before that day our preparations had been completed." The front selected for the attack extended from the Ypres - Comines Canal, just north of Hollebeke, to the Ypres - Staden Railway north of Langemarck - a distance of just over eight miles. The average depth of the operations was one thousand yards, widening to the depth of a mile in the neighbourhood of the Menin Road. "Zero" hour for the attack was fixed at 5.40 a.m. The particular sectors of the front of special interest to the King's Regiment were the Reutelbeek sector (south of the Polygon Wood) into which the 4th King's of the 33rd Division moved on the 24th of September; the line immediately south-east of St. Julien (from which the King's men of the 55th Division, as well as other troops of that division, attacked the enemy at "Zero" hour), and the Langemarck sector in which the I 2th Battalion (20th Division) were in support on the 23rd of September. The King's men of the 55th Division were, however, the only battalions of the regiment which went forward to the attack at "zero" hour. After the Battle of Pilkem the 55th Division had been relieved, and the three brigades moved back to the Tournehem-Recques-Nordausques area for training. The remainder of August and the first fortnight of September were thus spent, until finally, on the night of the 13th/14th, the 166th Brigade relieved troops of the 61st Division in the front line from the Zonnebeke Stream (south divisional boundary) to about 1,200 yards east of St. Julien. The 1/10th King's (Liverpool Scottish) relieved the 2/6th Gloucesters, two companies taking over the front line and two the support line. The front line was still in a somewhat sketchy condition consisting of captured concrete dug-outs and gun pits with a line of posts formed of connected shell-holes. On the night of the 15th "V" Company sent out a strong patrol to reconnoitre the enemy's posts on the Hannebeke and also, if possible, capture them. The attempt was unsuccessful, as was a second made the following night. On the night of the 17th the two supporting companies of the 1/10th were relieved and moved back to "L.4 Post" near Ypres - wherever that was. On the 16th, 55th Divisional Operation Orders were issued. These stated that the 165th Brigade (with the 1/5th North Lancs. attached) was to attack on the right, and the 164th Brigade (with 1/5th King's Own attached) on the left; the 166th Brigade (less two battalions) to remain in reserve. The 165th Brigade was to attack with the 1/7th King's on the right and the 1/9th King's on the left; the 1/5th and 1/6th King's right and left support respectively. There were three objectives: Red Line, Dotted Line, Yellow and Green Lines. The 1/7th and 1/9th were to capture the Red and Yellow Lines, and the 1/5th and 1/6th the Green Line. Every effort was to be made to capture Hill 37. Other strong points to which particular attention was to be paid were Gallipoli, Hill 35 (Lens), Iberian, Delva and Capitol. Of the 164th Brigade the 1/8th King's were to attack on the extreme left of the brigade front. Two objectives were allotted to the Liverpool Irish (i) the Red dotted line including trenches and strong points on the extreme left, and Schuler Galleries; (ii) the Green Line which included Schuler Farm and a small portion of ground to eastward. In continuation of previous moves which began on the night of the 17th/18th of September, all units of the 55th Division closed up on the night of the 19th/20th of September into their final assembly positions for the attack. The move up of leading battalions to the positions of deployment was well carried out, in spite of great difficulties. The night was very dark, rain was falling heavily, and the front of deployment was an ill-defined line of shell holes. Nevertheless all units were in position before "Zero" hour. The success of this movement was due not only to very careful reconnaissance beforehand, and to the way in which the flanks of platoons were marked by notice boards and tape, but also to previous practice in night deployment whilst out of the line in training. At "Zero" on the 20th (5.40 a.m.) our barrage opened on the enemy's front line, and the leading waves of the assaulting troops moved forward to the attack. Almost immediately the enemy opened with a 4.2 in. and 5.9 in. barrage, which fell on our front line. The story told by the 1/6th King's was as follows: "The 9th and 6th K.L.R. became heavily involved in the fight for Hill 35, which was finally captured after a stiff fight, the 6th consolidating strong point on Hill 35 including Lens. Major Gordon and Captain Phillips wounded while reorganising the line for a further advance. Captain O. Eastwood, Second-Lieut. N. R. Phillips, Second-Lieut. Spratt were killed on Hill 35. Second‑Lieut. Wallington and all No. 1 Platoon of "A" Company were killed in a gallant attempt to capture a strong point to the south of Hill 35. The 1/5th Loyal North Lancs. and the 1/5th South Lancs., having come up to reinforce, Hill 37 was captured by them and the survivors of this battalion. Towards dusk a strong enemy counterattack on Hill 37 was beaten off with heavy casualties to the enemy. At 7.30 p.m. Lieut.-Colonel McKaig and Captain Brownell arrived from Transport Field, and former takes over command of the battalion." The brigade narratives state that at 6.20 p.m. the line held ran from "Waterend House (where we joined up with the 9th Division) thence to Hill 37 - Gallipoli Copse - Capitol - Keir Farm Dug-outs - Gallipoli, just north of which we joined up with the left brigade." There seems to have been no change in this line during the night of the 20th-21st of September. The 164th Brigade, on the left, had similarly experienced hard fighting. Looks like Promenade has covered it all for you in his excellent post, but here's his original entry from the Casualty Book. If I come across anything else in my research I'll let you know- Unfortunately, the Casualty Book doesn't give individual platoons, though I can add that the account in Wyrall (referred to above by Promenade) stating that all No. 1 Platoon were killed, is not totally accurate as I have the 'After Action report' for 1 Platoon completed by the NCO I/C the Lewis Section- so some at least survived unwounded. If you have a high-definition photo of him (at least 320 dpi) I would be very interested in putting one in the book. Not quite the same, but I've seen one or two battalion rolls included with war diaries, kept updated with casualties, replacements etc. Think it was one of the rifles battalions, 11th or 12th KRRC or Rifle Brigade. 11th Rifle Brigade David, all names by Company, however not all results such as wounded, KIA, hospital ill etc kept in Army Book 136. 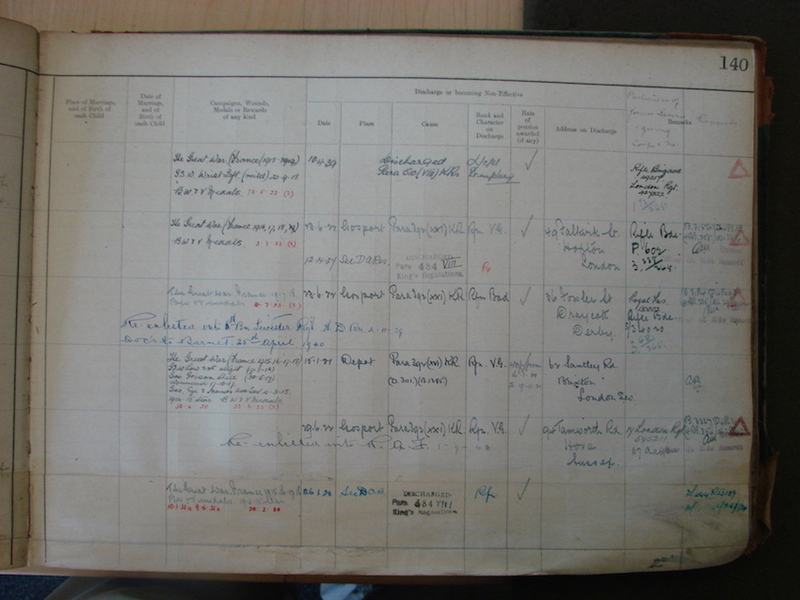 Another very useful source that usually details a soldiers service in the War is the attestation books for those re-enlisted detailing wounds, address, new army numbers, numbers served under in the war etc. Very useful for those elusive individuals and their service. Large volumes, left hand page, then right. Army Book 358. Thank you so much for the info - it has filled in quite a few gaps! I have a couple of pics of Alfred which I will forward to you but at the mo I don't seem to be able to add them to this post - any ideas? The single pic is of him c. 1917, while the other pic is of him, (on the left), and his brother Cecil c. 1914, just after enlisting. Not sure if the quality would be good enough, but please feel free to use them. 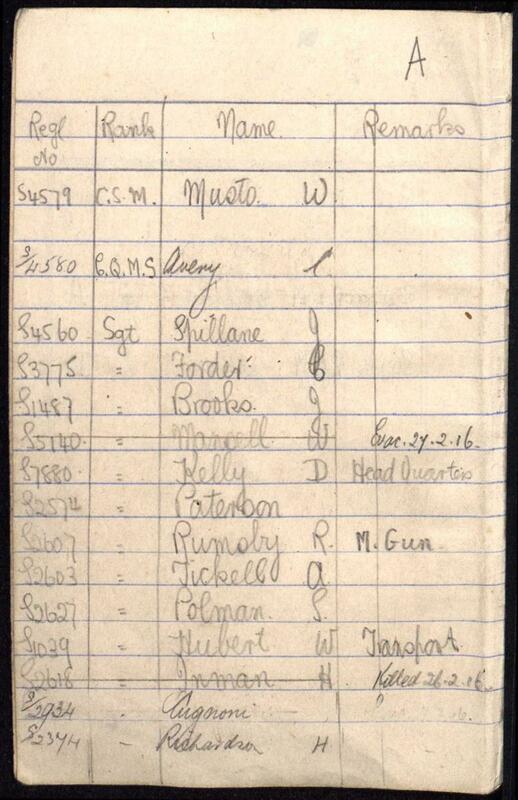 Most of the service battalions of The Rifle Brigade had these casualty lists. 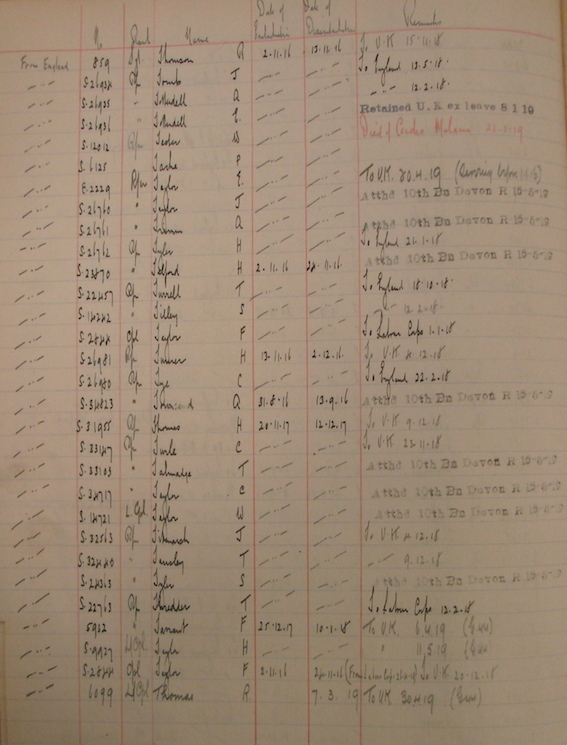 The 11th RB had a specific book, Army Book 136 listing their trade, when arrived, illness, wounded, Company etc as well as these casualty lists. One item of interest in the back of the first book are the details of a draft from 6th Reserve and 2/6th Manchester Regiment, who were transferred en-masse from 24 IBD to the 1/6th KLR in early August 1916. There are approximately thirty of these who became casualties before their transfer was processed, so will be recorded by CWGC under their original unit- not necessarily appended with 'attached to 1/6th KLR'- and possibly leading to some confusion from later researchers as to how they ended up buried where they did. I had similar issues with a draft of 87 men from 6 Cheshires, who were transferred to 1/5th King's Own around the same time, many of whom were still Cheshire Regiment when they were killed or wounded. Once I've processed these, I'll publish a list of all them in a separate post. These KLR books you have seem to be an absolute gold mine of information, Very fortunate to have these available.